Soundproofing does not exist. Nothing really can be made completely sound proof as the name implies. You can not keep all the sound energy at all times, in or out of your room. All you can do is manage the sound energy that originates from outside your room, with certain barrier technologies. Sound energy that originates within our room must be managed using sound absorbing technologies. It is the management of this energy that we must focus upon and the processes involved, not “proofing” anything from sound. What the name soundproofing really implies is noise management. How much noise do we have to keep out of our rooms and how much energy do we have to keep within our rooms. What frequencies does that noise reside at. What is the amount or amplitude of the noise we wish to manage or keep out or inside of our rooms at these particular frequencies. We must quantify the noise to determine the composition of our barrier. Soundproofing is all about using barriers that are specifically designed to handle the “noise” frequencies between the sound source and the receiver. Barriers differ from each other depending on the frequencies we are trying to keep out of our room. Frequencies below 125 Hz. require different barriers than frequencies above 125 Hz. The material used in the barrier is critical, but it is the density and arrangement of materials that we must concern ourselves with. With barrier technology, we are reducing vibrational energy that is caused by sound pressure waves and rays exerted upon the barrier surfaces. Arranging different materials with different densities in a manner that reduces vibrational energy is the art and science of constructing the proper barrier for the measured noise issues you are faced with. When we live on a noisy street, we must use barrier technology to construct a shield between us and the noise source. This barrier must use vibrational science to minimize the transmission of sound energy from one side of the barrier to the other. If its the bell on some child’s bike that is a concern, then the garbage truck is another issue entirely. Frequencies below 125 Hz. are difficult and the barrier technology required is expensive and can be space consuming because of its required mass and densities. Frequencies above 125 Hz. are much easier to manage. To find out what barrier technology we should use, we must first determine how much of what frequency, we need to isolate ourselves from. The child’s bell is of a different frequency range than the garbage truck muffler. It is also of a much larger magnitude in strength. The child’s bike bell can be isolated from completely. All we can hope for with the garbage truck, low frequency, energy is to reduce its impact in our rooms, so that it is below that of the room’s use acceptable noise level. Stopping low frequency noise completely is not an option. We must lower its sonic impact and bring it down below the intended use of the room, so it does not interfere with our sonic objectives of our room. STC or sound transmission class rating is an antiquated measure of noise levels and rates from 125 Hz. – 4,000 Hz. It does not measure below 125 Hz., so for any noise that involves frequencies below 125 Hz.,we must look to other units of measure. There is software available that will construct suitable barriers to deal with the energy below 125 Hz. Barriers that impact energy below 125 Hz. are best left to professionals. There is plenty of information for barriers above 125 Hz., but vibrational isolating construction techniques must be followed even with these frequencies. Barriers are constructed to minimize vibrations. Sound energy from an outside free field source radiates its energy in the forms of waves and rays and this energy travels towards us. It strikes the surface of the barrier we have constructed. To build the appropriate barrier we must use multiple layers of different materials that have different densities. The composition structure of the material and the material’s density, all are considered when we create the barrier. Our vibrational goal is to force the wave or ray to have to travel through different “fields” of materials. These materials are arranged in such a manner that based on the vibration’s frequency, they slow the vibration as it travels through our barrier from its originating end, through the barrier, and eventually into our room. Our goal is to reduce the magnitude or strength of the vibration itself by making it travel through a vibrational reducing, “obstacle course”. Maybe we use materials that have densities that are larger for the outside surface of our barrier and work through the barrier construction with materials that have lesser densities. Maybe we start with materials that have lower densities and work through the barrier with materials of larger measured densities. It all depends on what frequency range and how much of each frequency we need to isolate against. Our goal is to reduce the structural vibration’s amplitude so it has less audibility when it converts to an acoustic wavelength. The use of the term “soundproofing” should be changed to noise management. Clients often use the term without knowing the context into which the term is placed. Their expectations are larger than our current science and in most cases much larger than their budgets. Can we “sound proof” for frequencies above 125 Hz.? Of course, as long as our barrier constructions takes into account the magnitude of the energy we must isolate from. Can we “sound proof” for frequencies below 125 Hz.? The answer depends on which frequencies and how much of them we have to deal with. If we look at frequencies from 125 Hz. down to say 80 Hz., we have a fighting chance, once again, depending on energy strength. Frequencies below 80 Hz. are are a different issue and the term soundproofing and even noise management becomes lacks certain meaning and applicability. 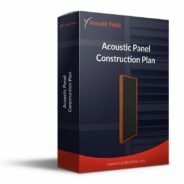 If you want to learn more about this subject please sign up for our free room acoustic treatment videos and ebook which provide step by step instructions on all major room acoustic issues. Get instant access by signing up now. In part one, we examined vibrations and the different mediums that these vibrations travel through. In part two, we examine how these vibrations produce sound in our structures by traveling through them. 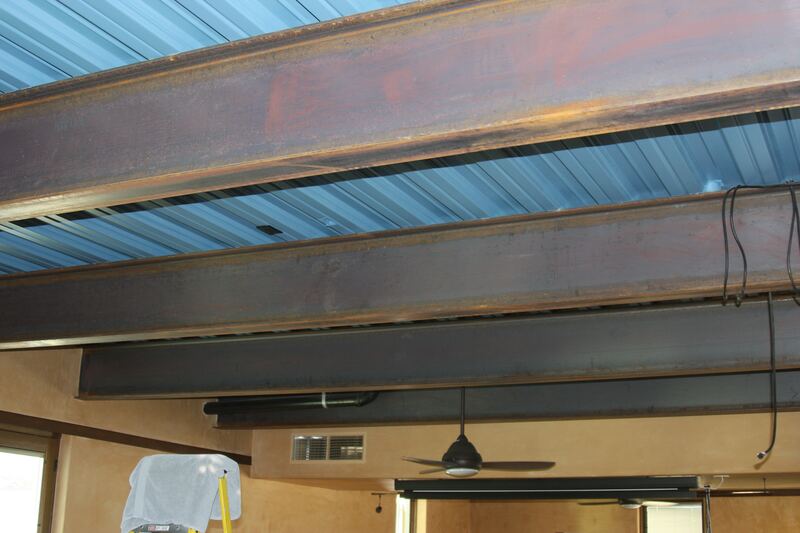 The way things are built and the materials used are critical in minimizing vibration transmission and incurring the appropriate sound transmission loss for our structures. Keeping all of this in mind, a wall that is deemed “soundproof” should be two walls independently separated by air. 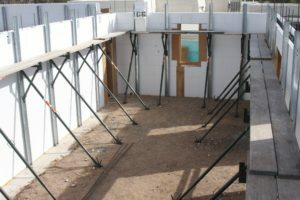 Each sill of the two walls must be distinctive and the studs in each wall must be staggered, so that they do not line up so sound energy will see a “road” to take. Each sill must be attached to a very solid surface. 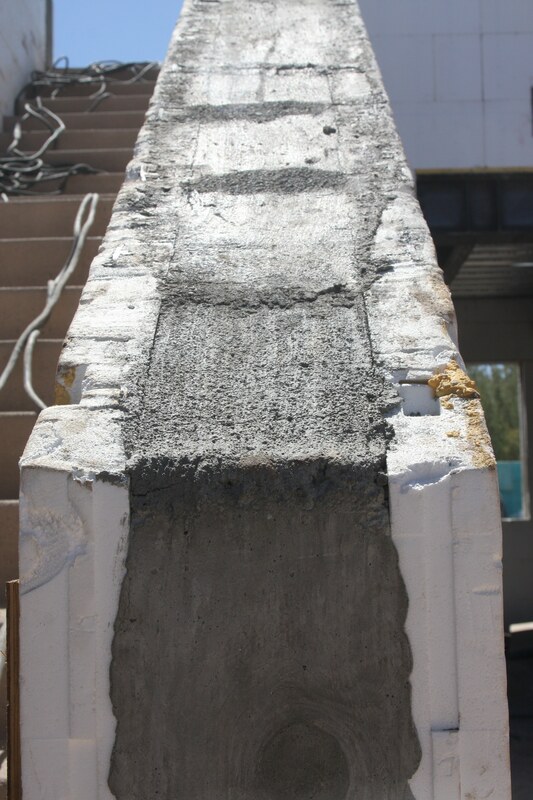 This is usually concrete which is very dense and makes for a good attachment point. 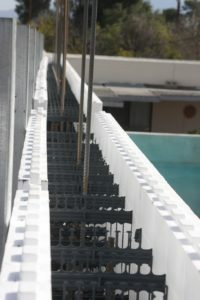 The sill should be isolated from the concrete further by using a damping compound. There also can be no “leaks” for acoustic energy to travel through. Acoustic or sound energy is like water, it will run to the area of its least travel resistance. Vibrations cause resonances. One quickly realizes the power of resonances when they deal with room modes between two parallel surfaces within their home theater, listening rooms, or professional recording studios. We have discussed how resonances can be reduced if we use mineral wool or some other type of fibrous materials. However, resonance can also be our worst enemy. Every material we use has a frequency of resonance. The exact resonant frequency will be dependent on the mass and physical dimensions. When sound energy strikes the panel and it is at the panel’s frequency of resonance, the panel will be set in motion and will start moving like a diaphragm. This minute movement will will assist in energy transmission through the structure and may even create its own sound. All multiples of the panel or wall’s resonant frequency will also be affected. We can not eliminate vibrational transmission through our structures, but we can minimize it and reduce its amplitude down to an insignificant level. To accomplish this, we use damping. Fibrous materials or damping compounds can be useful. Damping aids our vibrational transmission chain by reducing the vibrational levels of the materials it is applied to. One could say that damping prevents materials from continuing to vibrate once they have started. If we use multiple materials that are damped, we must select materials, so they do not have the same frequency of resonance. In past studio builds, lead was used extensively because it had a high mass density and it was limp so that its resonant frequency was below audibility. Now, due to health regulations, limp mass vinyl is more common although not as dense as lead. Our floors are another room boundary surface area that must be dealt with when we are examining soundproofing. 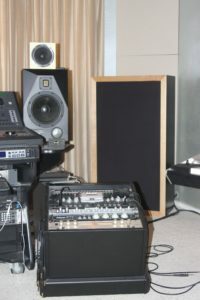 Noise sources that cause us sound energy issues are almost all connected to the floors of our home theater, listening, and professional recording studios. Footsteps are a good example of contact with the floor and most of the time our speakers sit on the floor. How about that sub woofer in our home theaters. If we want to keep the sound energy in our personal listening room from reaching the rest of the house, we should use the basement with its dense concrete floor. For a project studio, we should go to the top floor, so no one is above you. Our floors contain a great deal of energy. The moment sound energy enters the floor, it will move and travel through the whole floor. Even though it is a layered structure, all layers have to be attached at some points. It is through these points of contact that energy transmission can occur. From a design standpoint and taking all of this into consideration, it is best never to let the vibrational energy into the floor at all. Carpet is a good start for footsteps. A foot stepping on a carpet will produce hardly any sound through vibration. In multiple floor apartments, carpeting is always recommended in construction drawings for this reason. Speakers provide for a completely different set of issues. Our acoustical goals with our floor standing, energy producing, speakers must be to reduce and minimize the energy produced from low frequencies by our speakers. Rugs will not be effective for our low frequencies because they are soft and low in mass, so they will allow transmission of energy especially low frequencies. One should use spikes in your speakers because the difference in abrupt change of mass at the floor and spike contact point. This small contact area will not let many vibrations through it. Spikes are not funnels for energy into the floor and out of the speaker cabinet as some spike and cone designers will tell you. Why would we want to dump all that energy into the floor and get it moving. Floating floors are a popular vibrational reducing technology. They do not really float without any point of connectivity, but their connection points are distributed throughout the floor structure surface area. A floating floor is really a completely separate structure that is isolated with neoprene supports. It is best that the sub-flooring under our floating floor be as dense as time and money will permit. Windows and doors within our room are other portals through which sound can enter. We have all heard that an open window is a perfect absorber. It is perfect because once sound leaves through the window it never returns. On the other side, sound can enter through our closed window and the surrounding structure. Doors must be constructed of multiple layers of materials that have high sound transmission ratings. Better yet, take our multiple layered door and build two doors and separate them with a layer of air. This structure is termed a sound lock and works just like an air lock on a spaceship. What is important in planning a room is understanding how sound is transmitted through a structure, and becoming familiar with a few of the common techniques for limiting its transmission. It is the contact points between structures in our barrier technologies that are pathways for sound transmission. To reduce vibrational pathways takes planning and calculations which are best left to a professional. One contact point between expensive structures that is not properly designed and installed can negate the performance of the whole wall. All sound is created by vibrations. Sound vibrations must have a medium to travel in. The most popular and familiar medium is air and we hear those sound vibrations everyday through air. Air does a reasonable job of transmitting sound vibrations because it has low mass and can transmit sound energy over a wide band of frequencies. Air is a good medium for low frequencies but less effective at higher frequencies. When you are farther away from a loudspeaker, you will notice that the high frequencies are less pronounced or in audio jargon, rolled off. If you go to a live performance and you do not like piercing highs coming at you at large pressure levels, sit farther back. If you are trying to get the attention of your friends to help direct them to your seating area and you call out their names from far away, the same muffled high frequency effect occurs. 1. Soundproofing is really about lower frequencies. 2. All sound that is transmitted needs a medium to move through and that medium must be continuous. 3. In our audio rooms the medium will be a solid structure with mass such as drywall, wood, or concrete. Lets look at a sound wave as it leaves our neighbor’s stereo system. When the frequencies strike our wall surface, some of the energy is reflected back to the source and some of the energy goes through the wall itself. This is the point where people usually get confused about sound treatment and sound proofing. If we are trying to keep the sound energy within the room, then the room’s reverberation times will increase and we need to use acoustical treatment within the room. The sound energy that escapes our room, will not add to our room’s reverberation signature, but will annoy all individuals in adjacent structures. This is where soundproofing comes in. The hard surface of our walls is a partial explanation for this phenomenon. It is the hardness of the wall’s surface, but the composition of the wall itself. The wall has increased mass over air and this increased mass is like your car hitting a brick wall abruptly. The air is what we term to be compliant and the wall is much less compliant. This wide level of density changes from air to a solid wall changes the transfer of energy ratio. Thus, only a fraction of the energy that was in the air to start with will penetrate the wall itself. This is why our homes are quieter when all the doors and windows are closed. The energy that does not penetrate our walls must also be looked at and examined. We know from the laws of physics that the energy can not simply vanish. This comes from the First Law of Thermodynamics which states that energy is neither created or destroyed. Since there is nothing to absorb the energy, it will only be reflected back. If we place what the literature calls “acoustic tile” on the wall, we now have a situation that the tile is denser than the air but obviously not as dense as dry wall. This offers us a change in density. Tracing the sound transmission path, we have air to tile and tile to wall. Therefore, less energy will reflect back and some of our higher frequency, air borne, energy will be absorbed. However, more of our lower frequency energy will be transmitted. How do we reduce these transmissions? We know that we need an abrupt change in mass to have an impact on our vibration transmissions and thus sound energy. Lets examine two different structures to illustrate our points. If we take a wall that has two sheets of drywall glued together and nothing in between and a wall with the same two sheets of drywall separated by studs, we have two walls that have the same mass, but the wall separated by the studs will have a higher sound transmission class number holding back more sound energy. The wall with the studs contains more changes in mass or density for our vibrations to travel through. In our two pieces of drywall only example, sound energy strikes our wall and then travels quickly through both walls. In our wall with the studs separating the two pieces of drywall, we have an air space between the two pieces of drywall. 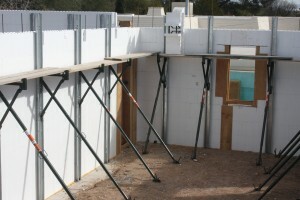 Incidentally, we can make that structure even more effective by filling the air cavity between the drywall panels with a fibrous material such as mineral wool or fiberglass insulation. That’s because the cavity between the drywall sheets will resonate, and friction of the vibrating air against the fibers will produce heat. We can’t actually destroy the energy, but we can turn it into non-acoustic form. Either wall structure will work well when we consider lower frequencies. In both of our wall examples, the drywall will have to be nailed to studs for support. It would be great if we could figure out how to have them “float” in space without any attachment points but that is not realistic. 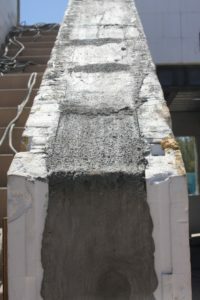 The drywall sheets nailed to the studs, will form a solid entity which is a road for lower frequency energy to travel upon. Even though the two walls are different because of the air space, they are both viewed as a solid entity by longer, lower frequency energy. Sound travels through mediums. Air is a medium and so are the physical materials we use to build our home theater, personal listening rooms, and professional recording studios. To soundproof our structures we must use mass that is arranged in a specific manner in order to reduce vibrations. 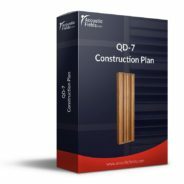 It is the vibrations that produce sound energy and proper structure vibrational management is critical if we are to have any success at the soundproofing task. In part two, we will discuss more on vibration and damping. Sound treatment and soundproofing are terms that have completely different meanings. Both terms share some of the same physics to arrive at their meaning, but both have completely different acoustical objectives. However, I can tell from the questions that I receive from customers, that the meaning of sound treatment is mistaken for sound proofing and the definition of soundproofing is used when we are really discussing sound treatment. Lets look at both closely, so we can see the differences more easily. Sound proofing is all about sound isolation. We are using barrier technology to isolate the receiver of sound from the sender of the same sound. The easiest way to do this is to build a barrier between the sound source sender and the sound receiver. We use barriers everyday to isolate sound from reaching us from other sources. We drive in traffic, roll our windows up and put the body of the car and the glass windows between us and the traffic noise. We live in our homes which are sound barriers between us and the noise of the world. 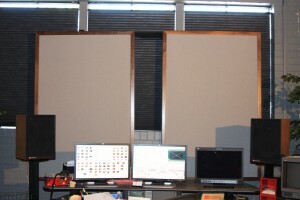 A recording studio uses barrier technology to achieve sound proofing from those barriers. We want our live room to not enter our control room. If it does, we want to make sure the sound pressure level is well below our monitors. Our vocal room must not receive any “bleeding” of sound from the live room. We want only vocals in the track, not drum sound from the live room. We achieve levels of sound proofing in each room of our studio by building barriers between the sound we want and the sound we do not, whatever the musical source. Each sound source that we are trying to isolate from has a certain frequency range to its sonic signature. The STC rating is an averaging rating technique that works from 125Hz. – 4,000Hz. . It is used to rate the ability of the structure or barrier to stop sound transmission through it. Different materials arranged in certain ways using their density as a variable will produce a structure that can stop the vibrational energy created by sound energy. The STC algorithm figures these densities into their calculation. The STC rating is not effective below 125 Hz. and is to be seconded guessed above that number because of its antiquated algorithms. The energy that is generated within our rooms from vocals, instruments, amplifiers, and drums fills the existing room with energy. That energy then leaves the room and strikes the shell or barrier is then reflected back into the room by the very barrier that we have built to keep unwanted exterior energy out of the interior of our room. We need to be conscious of this phenomenon when we are designing our room and provide proper pressure “relief valves” to handle this energy that is returned from sound sources within the room by our shell or barrier technology. Sound treatment is the term we use to refer to the absorption and diffusion technology that is applied to treat the energy within our room. We need to manage all surface wall, floor, and ceiling reflections. Low frequency energy resonances need to be managed and reduced to the level of insignificant. The chosen use of the room will determine what type and amount of sound absorption and sound diffusion technologies one employs within the room. 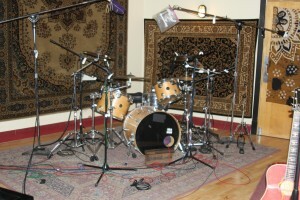 Live rooms in a professional recording studio have different acoustical needs than a control or vocal room. Likewise, control rooms need different treatments than playback rooms. Low frequency energy below 100 cycles fills our room and due to its longer wavelengths, reacts with the dimensions of the room that are not conducive to its wavelength. These room modes create pressure areas that can exaggerate certain frequencies that enter through them or completely smother them. A microphone placed within these resonances will tell this story better than words. In these pressure modes, some sounds will be heard, some will not. Low frequency pressure areas within a room of certain dimensions and volume are easy to predict but harder to locate. Proper low frequency technology must be applied in these areas to reduce the magnitude of these resonances. Middle and high frequency energy can be absorbed or diffused in our rooms. Reflections from our room’s floor, walls, and ceiling must be managed no matter what or who is listening. If it is an engineer in the control room, listener in a listening position in a playback room, or even a microphone in a live room, reflections from our room boundary surfaces must be dealt with. It is always a balance between the direct or straight line energy from our speakers and the reflections created off of our room boundary surfaces. Sound proofing is the science of creating barriers between a sound source and usually a human being. We need to keep sound energy that is generated from outside courses, outside where it belongs and not entering our rooms. The same barrier that is used to keep sound energy out of our rooms will also reflect sound energy that is generated from within our room back into the room itself. Sound treatment is the absorption and diffusion technologies that is used to treat the energy that occurs within our rooms after it is generated from sources inside our rooms. How to soundproof a recording studio can be broken down into two main parts. First, we have the recording environment. Is it for recording vocals, drums, choir, band? What will the sound producing sources be that will be recorded? The second part is the monitoring or playback environment. 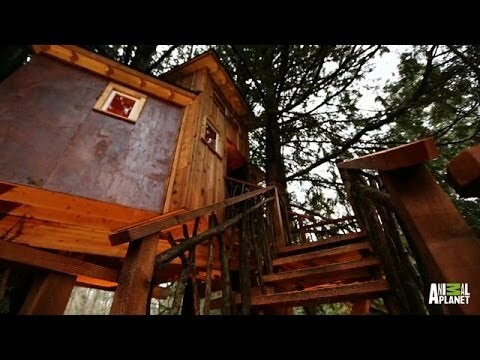 Is it the mixing, control, or editing room for film? What are we monitoring? Both of these areas have different soundproofing requirements. The “live” room or room in which instruments will be recorded in needs to be able to perform two very different acoustical functions. First, it must minimize the sound transmission from the live space to the rest of the facility. It must also employ sound absorbing and sound diffusion technologies to manage all of that “live” energy. In order to keep the sound energy within our room and to also keep sound energy out of our room, we need to construct a barrier between us and or our microphones and the outside room noise. This barrier does two things. It must reflect sound energy that occurs outside of our rooms, back towards the outside source and it must also reflect sound energy created within the room, back into the room itself. Yes, a barrier keeps sound out but also reflects sound back into it. The barrier works both ways and we must be aware and plan for this. A good barrier is poured concrete. One can use molds and build a wall by pouring concrete in the molds and letting it dry solid. The outside foam of the mold also helps a little with some sound isolation. A solid concrete room also has vibrational reducing qualities over a room built of wood. A wood framed room is another option. One should use two 2′ x 4′ walls that are at least 6″ apart. Both walls must be mechanically decoupled from each other and the existing room ceiling and floor. Another good barrier technology is block. One can add different materials to the block center to lower the sound transmission rating even more. Block is economical and can even be purchased with a quadratic diffusor built into the actual block itself. Sand can be added to the block center to minimize sound transmission through the cinder block sides. Barriers are necessary for our “live” rooms and our monitoring or control rooms. Inside our “live” rooms, we need to manage both low, middle, and high frequencies. Our goal acoustically is to make the room as balanced as possible with a smooth frequency response curve. We must address any room modal resonances with powerful low frequency absorption. Only a tuned absorbing technology will work for low frequencies at the SPL levels generated within a “live” room. Foam and boxes filled with building insulation will not work. We must always manage middle and high frequencies throughout the room. This management of middle and high frequencies can be accomplished through the use of absorption and diffusion technologies. In our live rooms we use absorption to lower reverberation times by minimizing the strength of reflections from the room’s surfaces. We do not want to overload our microphones with too many reflections. We need to know what the room sound is at our microphone positions and manage it accordingly. I like live rooms that have variable acoustic technologies. They can move a panel in with middle and high frequency absorption and produce a whole new room sound. 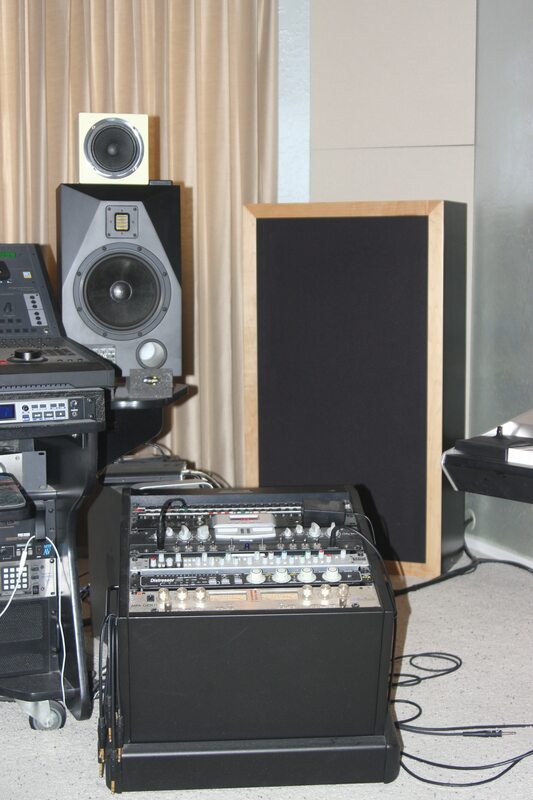 In a live room, portable low frequency absorbers can be placed in the room where resonances will be lurking. One can also keep the low frequency absorption next to the source of the energy such as a bass drum or tom and absorb excess energy closest to the source that is producing it. Absorb the low frequency waveform as soon as it leaves the source, so that it is reduced in strength immediately. Control how fast the low frequency energy “grows” in the room.This process takes a special absorption technology termed diaphragmatic absorption. Diaphragmatic absorption consists of a diaphragm that low frequency energy moves through. The diaphragm actually moves in response to the low frequency waveform. Two front walls moving in sympathy are even better. Once the waveform is slowed by the two moving diaphragms, it then enters the cabinet. Inside is a powerful sound absorbing material. Mineral wool is a possible cabinet fill material because of its higher density when compared with normal building insulation. Activated carbon or charcoal exceeds both of these materials by a factor of 10. The monitor room of our studio needs the same barrier technology as just described for the “live” room with the addition of a sound lock. A sound lock is two doors separated by a small hallway. This provides a triple barrier approach; the two doors one to the outside world and one to the control room and the air space between them in the form of a hallway , which is also acoustically treated. Windows also come into play in the control room. They are another barrier technology that must be addressed in any how to soundproof a recording studio tutorial. They must be seen through but must stop sound. make sure the wall in which the window is installed is equal in acoustic strength to the window. If you are using two 1/2″ glass plates separated by air, then you have a very powerful barrier. Make sure the window’s wall that is supporting it is equal in sound transmission loss strength. The rear wall of our monitoring room or control room should always be diffusion. The type of diffusion can be debated, but not the need for diffusion. The time delayed bounce off the rear wall at the monitoring position can not be. It is difficult enough to get a balanced mix with control room sound added in. We definitely do not want a large reflection that is severely time delayed interfering with the direct sound from our monitors. Live rooms and control rooms require the same barrier technology. We want to keep energy out and energy in. Low, middle, and high frequency absorption technologies must be used in both. Diffusion can be optional in a live room of adequate size. It is mandatory in our control room. Quadratic diffusion can provide two dimensions of sound diffusion for our control room rear wall. Working out how to soundproof an apartment sounds like a daunting task. It is not easy. With paper thin interior walls and noise generating people living above, below and to the sides of you, it is not easy. Our soundproofing must also be portable and mobile, so after we get kicked out, we can take our stuff with us. Lets back track a bit and see if we can figure out how to soundproof an apartment without getting evicted for excessive noise. Fist, we must decide who or what is making the noise and how much of it we have to soundproof for. Is it our neighbor to the east that is playing his stereo at certain times of the day. Is it the family below with the home theater system that has more sub woofers than acoustic sense. Is it your electric guitar playing or better yet, how about drums? We need to identify what source and level we are dealing with no matter if it comes from inside our apartment or outside. After identification we now need to determine what our sound pressure issues are. Place a Db meter within your room at the quietest part of the day. Do the same for the loudest part of the day. Record this information. Measure outside your room to find the level of the noise outside our room. Pick the loudest part of the day and what you think is the quietest part of the day or night. You will have to set your alarm clock for this test. Once we have both numbers or sets of numbers, we can decide what method in our bag of tools on how to soundproof an apartment. What is the difference in the two sets of numbers? Lets look at the outside low to high representing the nosiest and quietest times we measured. Was the pressure reading at 85 SPL during the loudest outside. Was it, say 60, during the quietest. Was the inside measurement, say 50, at the quietest which was probably 2-3 in the morning and maybe 80 at the loudest when you were playing guitar. If we want the quietest within our room, we must stop 35 decibels of sound energy from the outside during the loudest part of the day for the quietest part of the day inside our room. Each dB of energy costs money. For illustration purposes, lets take the path of least resistance and the path that we have the most control of. Lets say we are making noise from whatever the source and we want to protect our neighbors from it, so we do not get thrown out. The very first thing we must do is turn down, talk lower, and play more softly. Don’t like any of these options? That’s all good. You want to play louder passages and sing rock and roll. No worries. We will just build a new room within your apartment, just kidding. It is an ideal approach but it would have to be designed so that it was self sealing, think of sound like water, and it would have to be assembled and then dis-assembled when you moved. Don’t forget about the additional weight upon the apartment exterior and interior structure. A room within a room is ideal acoustically but not practical in our discussion of how to soundproof an apartment. If we turn down in all areas, we can focus on the inside surfaces of our room as a start. Excess energy from within our room can be dealt with using sound absorption technologies. If we have a low end or low frequency generating device in our room, we can use low frequency sound absorbing devices. The smaller our apartment, the more we need to make it smaller by adding low frequency sound absorbers. With the wall surfaces of our apartments we could use acoustic foams to absorb excessive middle and high frequencies. Reflections from our room wall surfaces can be treated with sound absorbing materials to reduce the strength of the reflection and help us to lower the overall room reverb times, so our vocals and instruments can be heard clearly without trying to pull them out of some sonic soup. Draperies can be used or open celled foam acoustic panels can be color coordinated into the decor of the room. Furniture can be placed at least the large cushion sixes for lower frequency control above 100 cycles. If you are going to play sound sources with bass drums and guitars, you need to move. There is simply no way to treat your room to manage the noise to your neighbors without building another room which is mechanically decoupled from your apartment at every mechanical connection. The floor must also be separated from your existing apartment. It is best with these instruments to get a free standing structure away from other people. We can control the noise levels within our rooms and certain instruments are just not practical for apartments because so much new construction is needed. Work within yourself and the surfaces of your room to control reflections and either add lots of thick soft furniture or build low frequency absorbers that can be tuned to your room for maximum performance. I hope this explanation helped. Please leave any comments below so I can get back to you. Don’t be afraid to hit those Facebook like, Google+ and Twitter buttons on the left hand side so other people can see this post. And if you want to learn more about this subject please sign up for our free room acoustic treatment videos and ebook which provide step by step instructions. Get instant access by signing up now. What is a window? 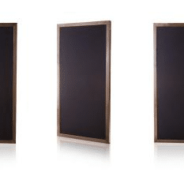 It is a wall that you must see through for various reasons to perform certain tasks necessary in your control rooms, project studios, or listening rooms. 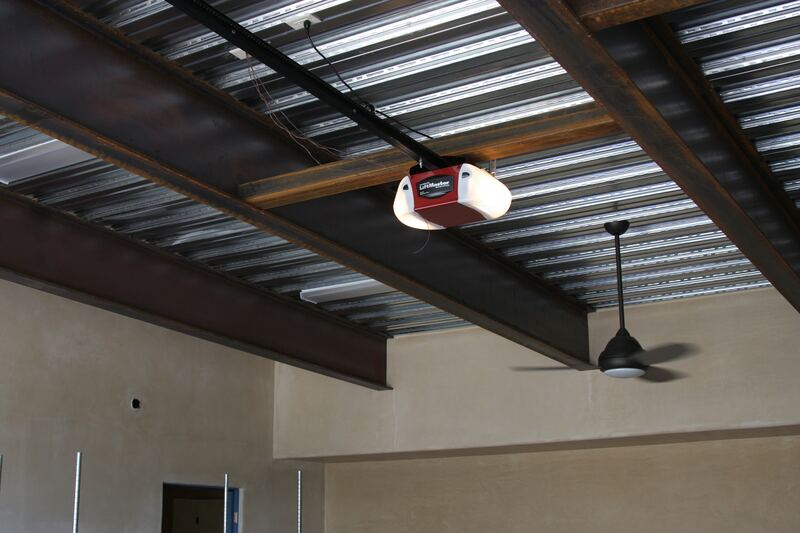 In order to sound proof it, you must treat it as any other structure within our room in terms of acoustical issues. You must address isolation issues especially with low frequencies and reflection issues with middle and high frequencies if you are going to learn how to soundproof a window correctly. The sound isolation of a window is necessary to keep unwanted sound energy from outside sources out. If a band is playing outside your control room, you definitely want to keep that energy out. You need to first decide how much energy we need to isolate, lets say, a control room environment from. Measure the energy within the band room with a simple SPL meter. Take measurements from the band using a ballad and then a full blown rocking out song. Measure the frequency response of all that pressure and you will see most of the problem causing energy is low frequency. Once you have assigned a number to all noise and sound issues, you can begin to design your window. Line of site is critical and you must decide how large of a window you really require to achieve all of your visual objectives. Determine this by blocking the existing area for the window and reducing its size down to the minimum window size required to accomplish all of your objectives. The smaller the better. A wall that is used for sound isolation is only as good as the weakest acoustical link in the wall system. The isolation of the window can not be greater than the sound isolation provided by the wall in which the window is installed. If you have designed a window with 60 dB of isolation and your wall you will install it in is only 40 dB, you are wasting your money and time. Noise or sound energy will flow like water through the weakest link in the acoustical chain. Make sure your wall is equal in isolation to your window. Isolation is difficult for most individuals to grasp. Sound isolation numbers are hard numbers and it does not matter to the wall or window, what device or devices you use to create that energy. I have heard people say that they only want to practice their drum kit, not play on a full set, so therefore they do not need to spend very much on noise isolation. There is no relationship to the cost of isolation and the devices that will be used to create the energy. Sound energy is sound energy and is measured by a number. It does not matter what produces it or how much that device costs that does. Once you have determined your minimum window size, you next need to determine what thickness and type of glass you need. If your low frequency issues are large, the thicker the window the better. Obviously a 1″ thick piece of glass will be more powerful in reflecting low frequency energy from its surface without moving and creating vibrations which will create sound. We do not need a single pane of glass that is very thick. We can use two thinner pieces. Laminated glass is preferable over regular plate because it has a thin sheet of plastic between glass sheets that will minimize our vibrations. Laminated glass is also called safety glass because if it breaks it will not splinter because of the layer of plastic between the glass sections. So if a angry guitarists throws his guitar against the control room window, all is good. We know that air space can be another layer of material that we can use to isolate sound energy with. Finding the correct distance is the more difficult decision. As a general rule, the more the better but we must work within existing construction materials and techniques. If we use a plate glass that is 4mm thick and use two plates close together, we are worse off than using a single 4mm plate especially between 200 Hz. – 700 Hz. With thin glass plates and larger spacing we are much better off. A good start point is to increase glass plate thickness to 12 mm which is about 1/2″ and to make your air space a minimum of 4″. If you have the space, a 6″ air gap is best. Reflections off of our control room window are always unwanted. I can not think of a single situation in which they are desired. In order to minimize the amount of reflections at the monitor position, we need to angle or splay the window surface so that the reflected energy moves away into another room surface. We accomplish this by angling or splaying the window at a minimum of 15 degrees from center. Find the area most impacted by the window surface reflections and splay or angle the window away from that area. When we install our glass wall, we are creating a miniature room between our two glass plates. In that room, with its walls, floor, and ceiling, we have a small box that can resonate with energy at the dimensions of the “room”. We need to line the window inside edges with acoustic foam that is designed to handle the resonances that can be created inside our “window room”. Placing the acoustic foam around the window edges with a minimum thickness of 2″ will handle most resonances within our 4″-6″ window depth. Larger window depths will require larger thicknesses of foam. 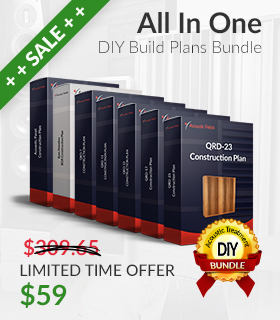 Plan for this early in the window design. Fitting a window into an existing wall requires several calculations before one starts. You must first determine what noise levels you are trying to isolate from. Next, you need to determine glass plate thickness and the distance between the two plates that will be needed to isolate from all invading frequencies. Angle the window away from the listening or monitoring position. Seal each plate to the existing structure against dirt and insect penetration and don’t forget the foam window lining. If you have any questions on how to soundproof a window please feel free to email me and I will be happy to help. Please message me at info@acousticfields.com. If you want to learn more about room acoustics please sign up for our free acoustic video training series and ebook. Upon sign up you will have instant access to the room acoustic training videos and ebook to help improve the sound in your studio, listening room or home theatre. Soundproofing a room means that people want to either keep sound energy from entering a room or keep the sound made in the room, inside the room where it belongs. Most of the time both are desired. Each approach requires different science to solve and before you start any project you have to keep these two sciences in mind. So first lets define each area of barrier and sound absorption technology before explaining how to approach the solution. To keep outside sound energy or any sound that is generated from outside your room, outside where it belongs, you need to use barrier technology. You need to create a barrier between the sound on the outside and your room. Barrier technology is designed to reflect sound energy back to the source or the direction in which it came by creating a barrier or sound blocking structure between you or the room and the outside sound source. To manage sound that occurs within our rooms, you need to use sound absorption technologies. You must absorb the excess energy within your room, so that it does does not create issues within the room. You must manage the excess energy through sound absorption, so that the sound energy does not “bleed” into the rooms that adjoin our sound room. Everyone has had this issue. You must first define what noise issues that you need your barrier technology to stop. What is the noise level you need to address that comes from sources outside your room? Is it traffic noise, people talking, manufacturing sounds? One must put a number to this noise. One can use a Radio Shack SPL meter (60 USD) or as they call it decibel meter. Go out in the morning, afternoon, and evening and take some readings over a 15 minute time span. Takes highs and lows and average, say 10 or so readings. Measure it over a one week time frame. Include hours of most noise and then measure the quietest times. Now, you must define what you have measured. What kind of noise is it? What part of the frequency spectrum does the most noise occur at? What part of the frequency spectrum does the smallest sound pressure level occur at? Is it low frequency, middle frequency, or high frequency noise we are dealing with? This is a little more difficult than using a SPL meter. One will need to take frequency response readings to match the pressure readings. This is best left to the professionals unless one is familiar with the process. All of this information is required in order to build the proper barrier technology to minimize your noise issues. If you have low frequency issues from garbage trucks going by, one must build a different barrier than if you are trying to keep the phone voice from the next office from disturbing your lunch. Defining what your room will be used for is critical. If you are recording within this room, we need a certain sound pressure level of quiet. Are we recording vocals or bands. Each has different “quiet” requirements. If you are using your room as an office, you need to be concerned with middle and higher frequencies from entering, so that vocal mid range frequencies will not be impacted. Intended use is critical for defining how much we have to spend with barrier technology to protect your room’s sound environment and lower the noise floor to acceptable minimums for the room’s use. Once you have all your data about the outside created noise and have defined your intended room usage, you can choose the materials and wall construction method to address the level of frequencies of the noise issues we have coming in from the outside. If they are low frequency issues, it would be advisable to find a new location. It is usually more cost effective to find a new location than trying to stop low frequency energy. Low frequency energy take thick barriers to isolate you from the long low frequency wavelengths. The more mass we use and use it we must, for low frequency energy isolation, the more our costs go up. Considering the cost of isolation from these long and powerful wavelengths, it is very difficult to build the proper wall to keep this energy at bay. Every low frequency Db costs lots of mass and money to isolate oneself from. It would be better cost wise to consider another location if you have to deal with too much low frequency energy in your room. If you are in an office environment and need to absorb excess voice and office equipment noise, you can use standard sound absorptive technologies. Sound absorbing foam can be used along with sound absorbing ceiling tiles. Drapes can cover office windows and special builds can be created to control and mange equipment noise. Even a couch can be an absorber. If you are recording a band within your room, you will need to mange and control the full frequency range of sounds. Drums produce low frequency energy and that energy must be managed, so that the microphone picks up and thus records the drum sound the engineer wants. Absorbing excess drum sound means less room sound or more depending on what the producer thinks the drum part calls for. Excess low frequency energy within a recording studio is usually unwanted and specially designed and positioned low frequency absorbers must be used. Our vocal rooms are usually located within our studio walls. There is a reason for this. Vocal rooms are a room within a room. This is an ideal method for achieving sound isolation. They are full of sound absorption and diffusion technologies to manage the sound energy within the vocal room itself. The studio provides the barrier or shell to keep outside noise outside. Usually a balance of sound absorption and diffusion technologies are used inside a vocal room. How to sound proof a room must be approached in a series of steps that you must follow in the order listed above if success is to be achieved both inside and outside the room. You must employ barrier technology to keep unwanted noise out of Your room and then you must use sound absorption technology to soak up excess sound energy that is generated within Your rooms from sound sources such as instruments and vocals. One must measure how large of a noise problem, both inside and outside your room, and construct the proper barrier to mange this unwanted energy effectively. Once you have your numbers, you can design and build the proper structure that will accomplish your acoustical objectives without draining your financial objects. This article begins by talking about the lack of proper sound proofing in the past. It then continues on to discussing the proper methods of sound proofing in today’s day of age. 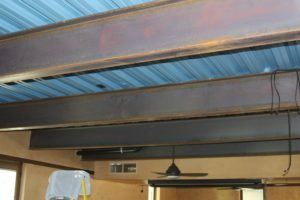 The article discusses sound proofing walls by using the proper type of screws, sound proofing windows by using the proper type of foam insulation, and sound proofing “rooms within a room” by building a room in a certain manner.